Michael Woodward talks with Bix and Joe Bickson the original father-son Future Hackers. Every dreamer, maker, innovator, and influencer will want to listen in. about the importance of transformational conversation in making the future you desire. 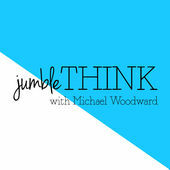 This is Michael Woodward in this is episode 55 of the jumble podcast. I’m a. WELCOME TO THE JUNGLE thing podcast podcast focused on telling the stories of dreamers makers innovators and influencers along the way will give you some tips on how you can shape your big idea and dream and make it a reality. On the podcast today we have father son team picks in Joe bics and more about them in a moment on Thursdays episode we have a brother team. It is Elan and Ngai Ferdman day are life coaches entrepreneurs podcasters speakers so much more. They have been featured on the art of charme Huffington Post Entrepreneur magazine freedom fastlane superhuman entrepreneur. So much more. They are truly relentless dreamers. Their story is inspirational and I can’t wait to share it with you this Thursday. Do you have a big idea and dream and you don’t know where to start. Head on over to jumble think dot com and check out our resource center where you can find books from our past guests along with some resources for podcasting or chasing your dream right there just head on over to jumble think dot com. Click the resources page and you’ll be connected with some great resources for your journey. Now let’s jump into our interview with pick’s in Jopek. Our guests on the podcast today are Bix and Joe Bickson of Bickson2, a supercool company. They are future hackers. We’ll talk more about what that means and what they do. They’ve worked with executive teams from companies like Adobe Microsoft Chevron ganas Starbucks for and many others. They are a multigenerational team baby boomer and millennial father son. And that story is pretty incredible. Now let’s jump in in my interview with bics and Joe. Super excited to have our guests on today. Their names are bics and Joe Pearson. They’re doing some cool stuff there based out of Vancouver Canada. I hope you guys are enjoying the weather up there how you doing. Oh the weather is fabulous. We had we had a lot more than usual wet spring so we’re all delighted with this nice hot sunny summer. Yes. Good to be here Michel. You are doing some cool stuff. You have a company called pixels squared or B squared or picks into picks and Today.com. Tell us a little bit about what it is and what you guys do. OK I’ll go first the suspects reading all the books and we know that one of the things that said over and over again in today’s world is you have to disrupt yourself or others will do it for you. And so that’s really been the story of my life. You know how when people get awards they think their parents. Well I want to thank my parents for being so dysfunctional that I learned about disruption very early but my life has been a series of disruptions. And when I went to university of Trinity University I was a journalism major in my senior year I published my own newspaper. And they thought well that’s nice but you’re no longer able to go to university here because it was one of those kind of newspapers that called into question a lot of what the university was doing. That was a huge disruption and I ended up being in Berkeley in the late 60s. And from there going up to Canada and literally living off the grid with other friends some Canadians and some from the US in the woods living off the grid for 10 years now. And from there creating a consulting business walking into Genis Microsoft Starbucks Lulu Lemon and many many more to hack the future with that. So that my life has been a series of welcomes and sometimes very uncomfortable but in retrospect disruptions Yes. And as you can as as you can tell being because of sun this is like welcome to my life kind of experience. So you know because the baby boomer and you know who I am as the millennial And so you know I’ve had the opportunity to grow up and be a part of this story. You know my story starts in the 90s and you know I grew up playing videogames and you know taking part in this. This generation the things that we’re were doing as a generation and you know really my life has led me to here to my work with BE2 with Bicks you know walking into companies walking into organizations and hacking the future which we can talk more about later Michael. But so that’s a bit about me that’s really really cool it sounds like it’s been a unique but also very adventurous journey that you both have been on to come back to the place where father and son working together creating a new approach to how businesses create their future. So tell us a little bit about what it’s like to be a father and son and to work in that dynamic. The baby boomer the millennial two worlds colliding. What’s that like. Well for me the suspects it’s two things. Number one it’s a huge gift for to work with Joe and for to work with my son. You know it’s a huge gift that we really didn’t expect. You know because Joe what university and was doing all kinds of very internet things and one day I asked him does he want to do this thing with me. So on one side it’s a huge gift. And then when people ask me about it my response is he’s very patient. Yes. For me it’s. Thanks for asking the question. It’s it’s been a humbling experience. And yes spicks is very patient. And also you know I’m doing my best to you know stay humble and this kind of work definitely keeps me there you know challenging myself going into speak with leadership teams CEOs is a has absolutely been a gift to my life and absolutely challenges me and in every way you know the thing you know that we sort of take for granted. But I love your question called What what is it like for us to work together. Because we we take it for granted but we know that there is an experience getting created when we’re there of people sitting there going Ha there a father and so on. What I’m not going to let you go that easily I I want to dive a little bit deeper into the larger cultural question here and how millennials are getting pretty hammered by boomers as a whole other lazy they’re just they have no passion they can’t stick out a job they can’t do this they can’t do that they can’t whatever. I don’t tend to think that’s completely a good picture of the reality but what’s one thing that I guess there’s two questions here. Here’s the first question what’s one take away that you’ve learned about the other generation by working nominally as a father and son relationship but also in the workplace being coworkers in creating what you’re creating what have you learned about the other generation that you wish more people knew. Well one thing is that they’re just like us at my age. It’s easy to look at the baby boomers and say oh you know they absolutely have been you know the past 60 years. Have been you know creating businesses that have really been destroying the world. And you know there’s lots of those conversations regarding you know look at this mess that we’ve walked into as the millennial generation. So now we’re supposed to clean it up. That’s that’s one perspective. The perspective that I am most often taking is the one that I recognize ha. If I were in their shoes I probably would have been doing the same things and the opportunity that I see and that I have been seeing is that you know through this work you know it’s not just millennials and baby boomers. Each generation has to reinvent ourselves as human beings on the planet Earth because we all have this opportunity together this short time on the planet to really make a difference so you know if it was one thing that stuck with me about this other generation it is that they’re just like me only you know presented with a different world. And one other aspect Michael is that you know we live up here with the First Nations and there’s one of the first nations is called the sailfish and they have this saying when somebody asked them about the world are leaving for their children. I have the saying is it’s not about the world we’re leaving for the for our children. It’s about the children we’re living for our world. So you know I have this great gift in my life that we get to create this together and you mentioned that it’s a great gift that you’re getting to create together. You know there are a lot of people who when they’re raising children they think of oh I’m so busy I’ve got to create my career. I’ve got to create wealth for my family whatever school that looks like to them. And as they get older they look back and say I regret the time I missed. And then there’s the whole. When you’re growing up as a kid you want your parents attention you get to that point when you’re like a teenager and then in college and in post-college where you don’t have time for the parent what is one thing that you would tell others that they really need to do in valuing their family valuing those relationships and valuing other generations. You are a good interviewer. Oh my gosh that’s a heck of a question. You know there’s as you know with your own children there is some very special experiences that we get to have one more with our children or our children are with us. And I think you know for me the thing that we say is that you know the world is out there by the time you check out of the supermarket and read all the magazines you’re not famous enough you’re not rich enough you’re not thin enough you’re not powerful enough you’re not handsome enough you’re not beautiful enough. And so the world’s conceit has designed itself in such a way that there’s this continuous messages of validation. And for sure our job as parents is to remind and to in any way we can allow our children not to be pushed around by those messages but to recognize that who they are. Is this a credible expression in the world and give them all the permission they need to live that expression. Does that response to your question. Joe do you have any thoughts on that. You know I’d say that for myself you know it’s really the opportunity is to in each opportunity that I’ve seen in my life if I were to look back on all the experiences that I’ve had is that really to continue to build a bridge over you know a lot of the conversations I hear today are while millennials are absolutely. You know they’re different. And so I think that there’s lots of conversations that tend to divide us. And so when you ask the question about family how can we value the relationships in our lives. It’s that we shift the conversation from one of. Well we’re so different to that. You know there’s actually a real opportunity for us to work together. And you know as in my work with exes is I’ve seen that I really have something to contribute inside of our work because you know I bring there’s a new world a new world of exponential organizations a new world of platforms of changing technology of you know businesses having to deal with this disruptive kind of change. And so when you know you know Bicks has been in this world of of leadership hacking the future for many years and you know I think when we talk about valuing ourselves valuing the people around us in our relationships and families we really have to build a way for us a way to look at the world that allows us to work together rather than one that allows us to maybe be separate or or have a conversation that that leaves us without relationship or relatedness. That’s really good as we transition into talking about what you’re creating internally as a company but also helping other organizations create. One question I think is a good transition point is you mentioned when you go into these meetings they’re like oh you’re you’re you’re his son or you’re his father and you’re meeting with these high stakes clients. Yes. There’s power in having multiple generations in their perspective and working with customers and clients. How has that created a benefit for you by combining multiple generations outlook in world views as you approach your customers. Good question Michael. Well what one of our important elements of what we do is it has to be fun because as you know from looking out into the world and as you and from the world of organizations and the world of performance in the world of results and the world of achievement in the world and everybody needs to do this and this is I think one of the things that Joe and I are working together is that it’s fun. You know we have fun. You know as far as we’re concerned most of life is trying to translate what translate whatever’s happening into a really good Saturday Night Live skit. Right. Because many times we look at each other when we’re working and we’re saying OK let’s just make the new the new series of The Office. Right. Because whatever’s happening in these companies is so absurd so ridiculous so clear that it can be shifted and really create something in the midst of that. So that’s that’s what one way. We definitely approach it. And you know our big question is the difficulty with being a father and son is we have the same mannerisms that we we have the same words we have the same you know obviously genetically we look a lot a lot alike except I don’t have hair. And so you know it’s weird for people. You know it’s like oh these guys from The Matrix. So we have to we have to say like I have to call John in the morning go what shirt what color shirt are you wearing pants. Make sure the cars were already look like cyborgs or something. Who are these people that want the same act the same talk the same one as a younger version of the older version. Yes I’m for it or respond to that question also Michael. You know you asked what can we learn from other generations. You know. One thing I want to go back to is let’s go back a hundred years to you know several generations ago. There’s there’s a story that you know we of you know we call ourselves future hackers and we look up to those characters. Those stories that have really shown us what’s possible in the world of future hacking. And so one of our favorite stories is a guy named Sir Ernest Shackleton at night 1914 Sir Ernest Shackleton was in London and he put out an ad to the London Times and it said men and women wanted for hazardous journey low wages and bitter cold. The safe return is doubtful. And so of course this is an intriguing add. Five thousand people applied for what was at the time what Ernest Shackleton had designed a voyage for the first ever journey across the Antarctic continent. Wow. And so he sets off. In 1914 he selected 28 people from this batch of 5000 that signed up. And there’s all kinds of great stories about how he chose these people mainly from their attitude rather than from you know their skills or ability to sail or things like that which is a lesson in leadership. You know the long story short he spent two years. The journey was planned for several months and they got stuck in the ice and the ship literally froze in the ice floe and they they drifted around. It was the wintertime in Antarctica which means no sunlight. And to give some perspective a previous journey had gone through that kind of experience of a winter in Antarctica and they literally went crazy because they couldn’t see anything. Long story short is siRNA Shackleton and his crew of 20 20. Every single person survived and there’s an infinite number of stories about how they had to live on the ice how they had to hunt the SEALs how they had to brave the 50 foot waves and 22 foot lifeboats and sail 500 miles and all these incredible stories. But siRNA Shackleton is really one of our absolute favorite future hackers. And there’s a lot that we can learn from. It’s a different definitely a different generation and that you know the way that he operated You know people might say a lot of times when we tell the story people say well what does that have to do with right now you know what my business is dealing with what I’m dealing with in my organization right now. And the truth is that it has everything to do with it. It was a leadership situation an absolutely complex difficult circumstances with a crew of people who are attempting to create something or in this case survive. So that’s that’s one response to that question that goes back 100 years from now who we’re going to dive into future hacking a little bit and her future US. Yes we’ve heard of consultants. Yes. What is a future hacker. Well. Well for one thing I was one of those seawards for many years. one way to think about it is one of the references we watch all the time is there’s a baseball player standing in the batter’s box and for all the baseball players the pitcher throws their 1998 mile an hour fastball. Some of those hitters hit the ball and some of those do not. Right. But it’s the same ball. It’s the same batter’s box. Pretty well the same bat pretty well they look almost the same. You know they have various but not that much in height or weight or size. And yet there are some that hit the ball consistently. And of course, the other side of that is even the best only hit three or four out of every 10. And that baseball is a game of failure and businesses need to learn that as much as much as the other side because you know we think that we’re supposed to hit the ball all the time and that’s a whole other conversation. Yeah, but the other one is what is happening for the batter that hits the ball and future hacking is they see something coming at them different from the people that don’t hit the ball. As you’ve heard the analogy the ball slows down. And gets bigger. So they have all the time in the world to swing their bat and hit the ball. Future hacking is slow is having the ball slow down and get bigger. So you and your business have all the time in the world to accomplish what you’re committed to. There’s a couple of things there. The first one is that certain people are seeing patterns and things that other people are missing. So that’s pretty powerful. Yes. How can someone start seeing what’s unseen? How can they start looking to the future. And based on the patterns I mean there’s a great book called How should we then live by Francis Schaffer which was a study of history and then he made predictions. He was a futurist based on cultural civilization art religion and science are on the trends that we’re experiencing that he could predict predict the future based on history which is basically the same thing you’re saying there. What are the skills or what are the things that these businesses these individuals whether they’re a person that is an individual or even a corporation should start doing to see those unseen markers along their journey so that they can start creating the future. Well future hacking is a is a body of what we call big ideas. And one of the so-called big ideas that we invite people to consider and what you know the first thing we first conversation we have is to say to people that when we speak to you who you are for us is that you’re already successful that you’re already accomplished that you’re already intelligent that you’re already committed that you’re already dedicated human beings because that’s true for us. They wouldn’t be sitting or standing in the room unless they had already built a foundation of success accomplishment commitment dedication in their lives and in their careers because so many times they have experienced those C word people coming in and the message that the company is communicating is there’s something wrong with you that we need to fix. So we are attempting right at the beginning of our conversations to defeat that notion that there’s something wrong with you versus There’s something right with you. And on top of that foundation that you’ve already built in your lives and in your careers we’re inviting you to consider something else as possible. So that’s the first message. So we’re attempting to create a relationship because as you said at the beginning of your podcast and as you know as we listen to you Michael you’re a master of immediately creating relationships with people you know jumble think wouldn’t have gotten created you wouldn’t be doing this unless you knew and know that you’ve got to connect with people in a way that they feel that they can trust you that they can listen they can have fun they can be themselves. Yeah. Thank you. So you’re looking to be one of those people in the world. So what was we’ve begun began to have that conversation our whole gig is access and what we mean by access is you know when I started this many many many years ago and you walked into a bookstore there’d be a tiny little section reserved for management leadership strategy and all that stuff and now the bookstores are overflowing with all those books. Yeah. And if I take down any of those books I open it up I go and I say to myself This is great stuff. I love it. And but then I noticed that there is a gap between experiencing that it’s great stuff and being able to integrate that into my everyday actions. Yeah. So. So what’s missing for us what’s missing for people in these companies is access. So when you say how does that happen how does the ball get slow down and get bigger. We’ve got to create a way that people have access to what’s actually happening in their company in the batter’s box when they’re having all the things that are coming at them come out them the month end results the strategies their employees their budgets their you know the complexity of of their world. How do you do that. So we asked people to consider that what’s happening in an organization this business called culture. We’re inviting people to consider that literally that is composed of are the conversations that are happening the conversations they’re having with each other conversations they’re having with their customers the conversations they’re having about their competitors convert. And that really big conversation that we have with ourselves and why we ask people to Exeter that not like this is the truth. But like an idea is because if they can they can access it. It’s not theoretical it’s not abstract. They can listen to the conversations that are happening and then they can ask themselves will these conversations give us the future we’re committed to. And the great thing about organizations even though they act like it. Time and again is they are not genetically encoded. They can continuously adapt to the circumstances that are happening. So how do you adapt. You keep listening to the conversations that are happening in your organization with yourself and you keep asking us you know we are the chief of annoyance we enjoy. We enjoy we enjoy because we’re annoying people. First of all to listen to themselves to listen to each other so that they can see oh I see if I’m standing in the batter’s box and the conversation that I’m having is you know I haven’t hit the net for the last three times. You know I’m right on the bubble of feeling like I’m really not there anymore for playing at this level or that I never hit again. I never hit against this pitcher. Oh look at this it’s you know bottom of the eighth inning we’ve got to score. Those are all fine. Those conversations are going to happen no matter what we’re not. This is not about positive thinking. For our in our view positive thinking is trying to put something over the top of what’s actually happening. It’s rather than having our actions derived from all of our doubts concerns worries and fears heading our actions derived from our commitment and what distinguishes us as human beings as a species. We can’t imagine we can invent. We can create. We can stand. We can declare we’re the only species on the planet that can say something and act out of so every moment of our lives we’re making a choice we’re either acting from what’s already happening in the past already happened or we’re acting from what’s possible. And so our job as future hackers is to remind people because they wouldn’t be there unless they’ve done this many time in their lives in their careers. Right. Yeah the difficulty is the way they explain what happened won’t give them access to having it happen again except by accident. So our job is to allow people to see that those every breakthrough in the history of human kind. Every breakthrough in their lives and in their company came from somebody standing on their own two feet and saying creating imagining inventing declaring something is possible and then acting from that. And as you can tell I could go on for a long time. Let us stop to see if you have any questions. I think there’s a lot to unpack there and I know that we don’t necessarily have the time to do that. You mentioned the big idea. Yeah. And we live in a world of big data. How do we get people to stop listening to the noise of whether it’s you know you made the good or great comment there where it’s like we need people talking about culture in the organization what their customers culture is what’s going on in that environment. And so often we’re ruling our businesses by based on big data and data can tell us part of the picture. In your job of being chief annoyer at those businesses as you called it as being that voice that says hey guys let’s get back to what’s important here. How do you help them shift or sift through the noise of all of this stuff going on in these big organizations. To boil it down to the real voice of what is important. It’s a great question, Michael. Well one thing is you know in my you know I like to talk about my generation and something that interests me is to watch how my generation continues to adapt and enter the workforce and begin to relate to the world of big data. The world of exponential technology and all that you know so one one trend and one thing that you know that I think underlies also what this is saying is is there is this world of you know a lot of the time that the buzzword in Silicon Valley and elsewhere right now is disruption. You’ve got to disrupt. You’ve got to totally get in there and disrupt the industry and everybody’s worried about being disrupted or you know wanting to disrupt themselves. And we absolutely see that you know as Bicks began he said you know my life has been one big disruption. So you know what Biggs’s said is that we as human beings have the opportunity to have a conversation a specific kind of conversation one in which we are creating. And so you know we say that it’s not disruption which is the source but creation. And so if I’m a CEO and I want to be a leader and I want to change the world. And you know have something successful in the world today. What I notice as I look at the millennial generation is we are not going to put up with organizations that are not up to something in the world anymore. So I look out at these successful companies these days and then the ones that aren’t successful and you know as you asked your questions such a great way. You know what is the underlying theme that sifts through all the noise or all the fog. And you know one consistent thing that comes up as I watch is this idea that an organization has to have a transformational purpose in the world something that is brings people together beyond money and beyond. People gaining status in the world and so often you know we look out and we see these organizations. You know that are up to something. And the pull that that has not only on their customers but on the community around them such that you know Apple’s iPhone there’s people lining up you know week in advance just to get the new iPhone. So why is that. And it’s not because the iPhone is such a great piece of technology although that’s part of it. It’s that you know Apple has committed to something beyond financial gain. They’re committing to changing the world in and impacting design and impacting our lives in a positive way. Yes that’s what I noticed is that something that sifts through all of that is that some an organization and a leader stands up and says here’s what we’re really up to in the world. And then people can see oh I see it that’s something I want to be a part of and that you know it impacts their actions. And if you know the greatest talent in the world is moving to these these companies that are up to something and that you know are when we start with an organization we’re sitting with the CEO or the leader of the organization and we are working with them so that they can get a purpose out of their mouth that resonates deeply with themselves as a human being something that’s worth it for them and can create that in the world such that it’s an authentic generative a lot you know huge opportunity vision all those words that go with that. If a leader thinks well I can change my organization without changing myself forget it. Right. Right. And so we’re working with the CEOs first because they want that. It’s not that they don’t walk that they walked out but nope. Nobody’s hacked into them in a way that they know that they that is absolutely vital for creating the future of their business and their own leadership. You talk about going in and sitting down with the CEO and with different members of the team and starting to ask questions and a lot of people view consultants and coaches as the savior as the person that’s going to come in and say do X Y and Z and all of your problems are going to go away and we’re all going to run right into the sunset and the world is just going to be forever the perfect place it’s supposed to be. But you really put a focus on partnering with customers instead of being the savior of the day you’re coming in to walk on their journey. How is that approach different and how does that change the outcome that those companies get. Thank you. Yes. It’s it’s there. It’s always there meeting it’s not our meeting. So if there’s a CEO there standing up and saying here’s why we’re here’s why we’re getting together and here’s what we’re committed to doing this. I have asked Joe in expectation B squared to support us in fulfilling that endeavor. So the signal is right there from the beginning that this is their meeting. And we’ve designed all of our work together that it’s very early in our work together that people are generating it for themselves. And then our our definition of a team is to commit to each other for the to hold each other accountable for the results that they’re committed to. So it starts being peer to peer quite early in the game and we keep stepping backwards and infusing with ideas so that they can get their work done. Not it’s not about our work and at the beginning it feels like it is because these are new ideas new words new new methodologies and all that but that goes away very quickly. Does that begin to respond to your question. Yeah absolutely and I think going one step further you talk about the ownership of the change starts with whoever’s leading that organization or that department or whatever place that you’re working with. So if it’s the CEO of the company it’s their meeting you’re there to help guide them. And so you’re working with these executives and going to make a very wide statement here that is very stereotypical and completely unfair to make. So let’s just be honest about that from the get go. You know CEOs have a reputation of being very definitive very results driven very type A very focused. How you help them in their process to discover who they are. And change the things that they need to change because he mentioned that the change starts with the leadership not with you or not with even their employees. How do you help them in that process of that discovery of what’s going on internally with them whether it’s changing an outlook or changing who they are in their leadership style. What are some things that you do to help bring them back to that sense of true identity true sense of being. Well as you said earlier first of all annoy them. You said at first that is repeated. Good. Good. So one way to talk about it is to continuously strengthen that we’re real that we’re trying to figure this out together. That as you said we don’t have the answer but we know that we can create it. The answer. No it took me years Michel to have to sit across from a CEO in and have her or him say you know what should we do. I don’t know we got this big challenging and took me years to be able to say I don’t know. Yeah I don’t know. But I know that we can. First of all start talking about it. And second of all get a lot of smart people in the room to figure this out. And then the other thing is to be not kidding with them and a way to talk about that is to be ruthless and compassionate at the same time. So one of the first things that happens is we will you know CEO says OK this is interesting how do we proceed. And we say Well first of all we’re going to go talk to your team and come back to you with the the way they’re thinking about things. And two things happened in those conversations one would begin to create a relationship with the people on the team so that we’re not the fifth or the tens or the fifteenth consultant that’s talking to them so they say oh maybe these guys have something that is valuable. And number two to really hear what is going on in the organization. One way to think about that is that leaders are always projecting their unresolved issues onto the organization and the people in the organization are always living out those unresolved issues. So in these initial conversations with their team they loosen up enough to tell us here’s the way they see the world. And a lot of it has to do with the power dynamics in an organization and every organization has them no matter whether it’s you know the most highly touted coolest place to work or the most terrible place to work. Every organization has some of this going on. So we come back to the CEO or to the leader and say here’s what your people are saying and it’s very difficult because leaders for the most part are drinking their own bathwater. Yeah. So everybody’s telling them because they look at either they founded the company or they’ve built the company or they’re leading the company with success. So the people around them because of the power dynamics and because of everything else that takes us hours to unravel. You know that they’re to argue this and so preserve and all that. But at the same time they have all these other conversations that they’re experiencing. So our job is to be ruthless in saying here is what we are hearing. But at the same time being compassionate what we call soft eyes so that when we’re saying these things we’re not saying them as an attack we’re saying them as we know that you want to grow. You want to develop your business that you want your people to thrive that you want this to be a great place and a great business and every leader is dealing with these issues which doesn’t take the edge off because it’s their issues. And if they don’t deal with them it’s going to persist. So it’s that business of being ruthless on one side it’s very straight talk and it’s uncomfortable as can be for the leaders because it’s their team. They get up every morning every day and say you know what can they do to have this work. It’s not like they get up every day and say you know how can I make it a terrible situation for my people just the opposite. Right. And yet like it or not every organization has these dynamics that are happening where if they don’t get brought out from the background into the foreground they will drive people in ways that doesn’t allow the company to thrive. So that’s those first conversations are extraordinarily important. And then consistently somebody will ask in an early meeting to the CEO why are we doing this. You know one of the one of the guys we’re working up here we said listen your people are going to say to you why you why are we doing this. And this guy said to us because it’s for me I need to do this I need to take this on for myself to actually be the leader. I am committed to being for this company to be what it could be. So at that moment when somebody says Why are we doing this. That’s the signal for us that we’re the leader the CEO whoever she or he is to say no no no this is my gig. You know Joan Dix happened to be here. Yes. And they’re supporting this because this is my commitment does that respond to your question. Yeah absolutely. Joe, you mentioned a few minutes ago you know with millennials it was important for places like Apple and Google and businesses as a whole to create a bigger picture to create the change that they’re looking to create. Yes. Yeah. You are really pushing into something that you call new corporate DNA. What is that? I think I think that was the start of you know those comments are the foundation of that what is a new corporate DNA and why is it important. Thank you for asking. Yes so you know what the way we talk about it is if people are willing to engage with this idea that the DNA the culture you know the buzz phrase is Kultury strategy for breakfast so that you know what’s meant by that is you know get rid of your five-year plan. If your culture is pulling for some kind of future other than what you want to have happen in the world. it doesn’t have it. That’s right. Exactly. When you pull it out of water. Oh I see. This is water. OK. So you know the way we talk about it is human beings don’t know the water that we’re swimming in. So the first opportunity when we walk into a client is what is the water we’re swimming in. And the way we engage people is that to consider the idea that the water is the conversations people are having conversations they’re having with themselves with their coworkers with their boss with their suppliers with the customers with the competitors. So the first big idea is that human beings people in organizations. The DNA of that organization is the conversations people are having and why we ask people to consider that is because you can listen to those conversations. And so when you think about what is this new DNA First of all you’ve got to be understand what is the old DNA and the old DNA is something that you can listen to you can listen to it by going into an organizations and literally asking people what is going on at this organization. So then if we’re willing to understand what is the current conversation people are having What’s the current DNA What’s the current culture. Then people can see OK there’s a possibility for a different culture for a different DNA. And so we say that you know future hacking is a new management discipline it’s a new way for people within organizations to relay. of the things that you talk about a lot is creating a pathway for innovation. And creating a reliable pathway translate into ideas into action and resulting with velocity What does it mean to create a culture of innovation. Well once you know one thing we say is that choice is the gateway drug to freedom. And so once people see that they have a choice because when we start like it or not we as human beings literally experience being trapped but we don’t we don’t know we’re trapped until somebody shows us that we’re trapped we’re trapped in the kind of thinking attitudes behaviors approaches that we’re currently invested in and the. And that level of investment gives us the level of performance that’s possible. So the first thing is allowing people to see that they’re trapped in a way that allows people to see. All I see there is something else possible. And that’s what we call. Remember you know because of the word the word Remember comes from re member which means put back together again. So when people see when we see that we have a choice that at every moment of our lives we’re making a choice where either acting from what’s already happened which will give us more of what’s already happened or acting from what’s possible when people remember this the room lights up people light up. People are returned to what it is to be a fully expressive human being. So that’s the first thing that opens up. And so people remember they’ve got something to say they can create they can imagine they can invent them designing ways for them to express fully what’s possible. And as you know Michael you know people got to give permission in that in the organization for people to begin to say you know well what about this possibility what about that possibility. What about this possibility what about that. And the difficulty is we’re so used by how are we going to do that. of that came out of somebody saying why don’t we try and how about this. And if I do this and then if I do that why then somebody saying OK well let’s try it. You hey that’s the as the opening for innovation. I think that’s really really good. It Before we dive into rapid fire questions what would be the one suggestion you would give to a CEO or a business leader. That is just feeling completely overwhelmed by a situation in their job in their in their business. What would be a starting place for them to start. Unburying themselves and returning to a place of human to remember they have choices. First one is it’s normal everybody is sitting there thinking what they’re dealing with is their personal problem. And so we keep it relating to it. If I got over this if I was different if I was more educated and if I was rich or if I had more experience if I had a better team. So we all think it’s personal. So the first thing for CEOs and people that are having that experience recognized this is normal for us to have these kinds of thoughts concerns fears and worries and overwhelm us. That’s the first thing. The second thing is they can create their way out of this. We are the champion of people’s commitments. So you know if you look at every I’m realizing I’m a guy so I have to talk about sports I apologize. But look at the number of coaches on the sidelines. Right. really really good advice here. I think a lot of people get in those positions. Anyone in leadership has experience those moments of being completely buried. And I think it’s easy to feel isolated alone but it’s really helpful that the advice that you gave is really simple steps but powerful steps and really shifting not how can someone connect with you. They’re resonating with what you’re doing maybe they have a big corporation that they run or maybe they just want to learn more about the culture that you’re creating. How can they learn and connect with you. Yeah thanks for asking Michel. Great thing is Bicks wrote a book last year. You can find it at the textbook dot com. And then our Web site is w w w dot fixin to dot com. Yes. And you spell Bengtsson but b c k so and B is and boy and that and that’s that everybody will write b so and so for everybody all the I’s c k s o n 2. That’s awesome. Well let’s dive into a couple Rapidfire questions. These are questions that are a little bit more general. Just short answers for each one and I don’t know if both of you want to answer it or if one of you wants to run with each of the questions up to you. So a lot of fun. So what is a tip that you would give someone with a big idea or dream and they simply don’t know where to start. Start with the mindset so don’t start with thinking I need a bunch of knowledge or skills. Start with the mindset that I can create. That’s good. That’s good. And next question would be what is one change you’d like to see in the world around you. People. Getting over the lie. That were not profoundly connected to each other. And recognizing. We are connected to each other. That’s so good it’s so good. What do you want your legacy to be. And I think I’d like both of you to answer this as as a father and son as people that both are in different stages of your life. Legacy means different things to you. So what would you like your legacy to be. Well being the old guy I go for is that I can have the experience of fully contributing to people’s lives to life to the evolving organizations that are that we can create in the world that you know I’m committed to my legacy being that I contribute to life and to the world. Thank you. Yes. And my you know for me I’d say that I’d like to leave a legacy of play you know that for me play is the tension between the rules of the game and the freedom to act within those rules. And so you know I think the most biggest capability organizations and teams need to develop is the ability to play to play within the rules such that we can invent create. You know that that’s the hole in your website you say you we’re about dreamers makers innovators and influencers and I think the biggest capability for each of us and for those groups is is the ability to play really good who or what inspires you. Long long long long long long list. Let’s see. Well as Joe’s said the earner’s Shackleton’s of the world the Steve Jobs. But you know the the the guy out in a small company sitting there thinking I can create something you know that’s a huge contribution to the world and to our business. I’ve got a infinite list of people that inspire me. One of one of the videos that we show is Herbie Hancock’s when he was playing with Miles Davis and they were in the middle of this really jamming hot session in Stuttgart Germany. And Miles was wailing and the drummer was wailing and Herbie was playing the piano and Herbie played the wrong chord. And after a moment he played the wrong chord. He knew he played the wrong chord and he took his hands off the keys he put them up by his face aghast that he would do this. And Miles took that chord and created the whole next expression of his solo. Wow. Because there was no wrong chords for miles. There was only what happened. So our heroes are people that can live like that that no matter what happens they see they have the possibility to create that’s really good for myself I’d say. I think that’s that’s beautiful. The one thing that we say is that the world needs more Misfit’s that you know that those on the edge of society on the edge of the boundaries pushing pushing at the edges. And you know I think that so much of the world really puts Misfit’s down and it teaches us that we shouldn’t be a misfit we really should be doing being somebody other than we are. And so the opportunity I think is that and you know the heroes that I look up to are those that are that don’t necessarily fit and they’re the ones that are willing to be themselves and act themselves and do something phenomenal in the world without necessarily the cultural societal agreement. And that’s a problem for a father. It’s funny we had a great guest a little while ago and they said innovation happens at the edges and I just think that what you’re saying really resonates. It just brought back that memory. What are you currently reading or watching. I just got Tim Pharaos book. It’s something of Titans towards the Titans. Yeah. Yeah. Because he’s there’s a lot of heroes in that book right. So that’s that’s very cool. And you’re reading working on one of our favorite books recently that we’ve been reading is a book called play bigger it’s got by a guy named Christopher Lochhead. And a few other people that are really about how dreamers pirates innovators are reinventing the markets that their companies are R&D and really inventing audacious powerful companies in the world. At its core the deal sounds like two great bucks every and every episode with this final question. It’s probably my favorite thing to ask in the entire world. And it’s this what is one dream you’re still wanting to fulfill in your own life but to have be someone that can be recognized as as big as the ideas that we have. Right. So we’re always fighting for you know I’m not Steve Jobs. I don’t think. That. I know we’ve got this huge contribution to make. Yeah. And so we’re we’re battling two or I’m battling to have the opportunity to make that contribution. I’ve had lots of lots of great clients you know from Starbucks to Guinness to Lululemon to tons and tons more. But there’s still for me the opportunity to go. These ideas are really valuable. And how do I get the stage to make those make that expression possible. That’s cool. Yeah for myself I’d say that you know it’s really for my you know I’ve got this perspective of being able to work with a someone who’s a different generation of me and you know what I am committed to is that millennials really get the get who they are in the world get that. Each of us and each of us not just millennials but all people but especially young people who are going into the world entering the world and looking out and asking the question Who am I what am i up to. What do I want to create with my life. I’m really committed to that. Young people have the opportunity to really create their lives design and fulfill the future of their choosing and design in a way that leaves them totally switched on and absolutely fulfilled. Very very cool. Well Dixon Joe it has been just a lot of fun chatting with you today. Thanks for taking time out of your day and sharing your story with us. You are so awesome. Thanks for creating the opportunity, Michael. It’s clearly been a great conversation. Once again I want to think today’s guest picks NGO picks and picks and square for being the guest. You can check them out have to dot com slash all your links are in the upside notes along with on the jumbling Web site on Thursdays up so we have Yulan and Guy Ferdman the founders Tory prime and also the host of habit. All pod cast they’ve been featured in the art of charme Huffington Post entrepreneur magazine freedom fastlane superhuman entrepreneur. They are visionaries and relentless dreamers. Super cool guys. A fun episode we talk about all kinds of cool topics you want to make sure to check that episode out this Thursday. If you haven’t already and you loved the jumble thing podcast go on over to iTunes and make sure that you subscribe to the jumble thing podcast and makes it easy for making sure that you catch every episode on Mondays and Thursdays while you’re there. Make sure that you write a review and give us a rating helps us out and get the word out there so people know that the general think podcast is awesome and people should listen to it. I personally want to thank you for listening to the jumbling podcast. It means so much to me that so many people would take the time to listen to what we have to share along with sharing the stories of our guests who are incredible people creating amazing things. Ultimately I hope the podcast has encouraged you to go chase that big idea and dream. Knowing that it’s possible that others have done before you and Dave created their ideas and dreams. So I hope it encouraged you and that you get out there and create the world you believe could exist. Thanks for tuning in and we look forward to catching up with you in our next episode.